This computer-generated perspective view of Charitum Montes was created using data obtained from the High-Resolution Stereo Camera (HRSC) on ESA’s Mars Express. The image shows the large breach in the northern wall of the crater, located near to the uppermost sand dune. A European spacecraft orbiting Mars has snapped wintry-looking pictures of a mountain range on the Red Planet's southern highlands, where ridges and crater floors are dusted with carbon dioxide frost. The pictures were captured by the high-resolution stereo camera on the European Space Agency's (ESA) Mars Express. They show part of Charitum Montes, a large group of rugged mountains stretching over nearly 620 miles (1,000 kilometers) near the southernmost rim of the Argyre impact basin. The brighter features represent a seasonal layer of carbon dioxide frost. The images, which were obtained on June 18, show that the mountainous region is pockmarked with many large craters, which have been largely filled in with thick sedimentary deposits. Annotated image of Charitum Montes. The heavily cratered region in this image is at the edge of the mountain range, which itself wraps around the boundary of the Argyre impact basin, the second largest on Mars. For example, the large 31-mile (50 kilometers) crater dominating these images seems to have been loaded with Martian soil entering by way of one of the breaches at its northern rim (shown in the photo above in Box C). An adjacent smaller crater, which has several channels branching out of it, seems to have been filled in almost completely (Box D). 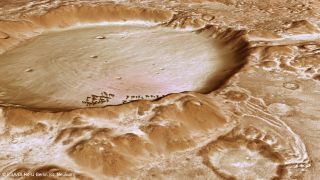 The Mars Express images also show several smaller pedestal craters, where are created when material ejected from the impact forms a higher feature above the surroundings — for example, Box A and Box B in the annotated image.